In my test, I used a wireless outlet set with three outlets and a remote control that is compatible with my home in Germany , but you should be able to find outlets that are compatible with the system in your country from other manufacturers via a web search. For the 433MHz transmitter module to talk to the wireless communication outlets, you have to figure out their preset house code and change it. To find and set the code, open the back cover on the outlet with a small screwdriver and set the respective code (Figure 3). A row of binary numbers stands for the house code, and letters of the alphabet identify an individual outlet. It is a good idea to change the default code so your neighbors won't inadvertently control your outlets. Figure 3: Setting the code for a wireless communication outlet. In my case, I used 11010 as the house code. To enter this code, I flipped the 1, 2, and 4 switches on the DIP switch up and the others down. 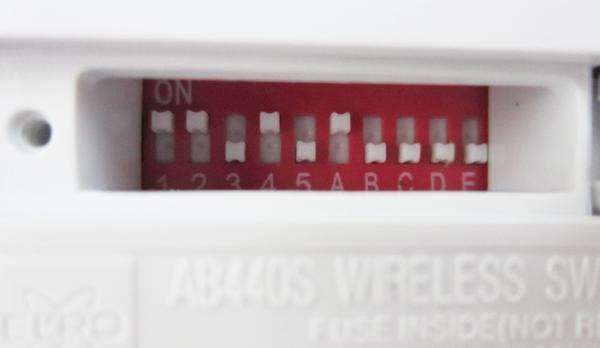 Next, you can configure the identifiers for the outlets. For example, you can configure the first outlet by setting the A switch in the up position; for the next outlet, set the B switch up, so on. By means of this configuration process, you provide an ID for each outlet to which the transmitter module can then talk. If you want to use one command to control several devices at once, you should allocate identical letters to every outlet. To deactivate it again, I would replace the last number with 0. This is the pattern for controlling the lamp and the coffee machine with the communication outlets that have been installed. Of course, the lamp has to be turned on and connected to the communication outlet, as does the coffee machine, which should start brewing the coffee as soon as the electricity starts flowing. This requires the TV to be connected via the HDMI cable to the Raspberry Pi. You should also plug the TV in to a wireless communication outlet to avoid leaving the TV on the entire night. Then, the Rasp Pi can turn on the TV, start the desired video, and cut the power connection after a certain amount of time has passed.